I start this blog by wishing all its readers a Happy New Year. May 2017 be a good year for you all. The beginning of this new year seemed a suitable time to celebrate the elephant by creating a new display in the Reading Room. Elephants have long been associated with the Royal Asiatic Society and were represented in the some of the earliest seals designed by Thomas and William Daniell. 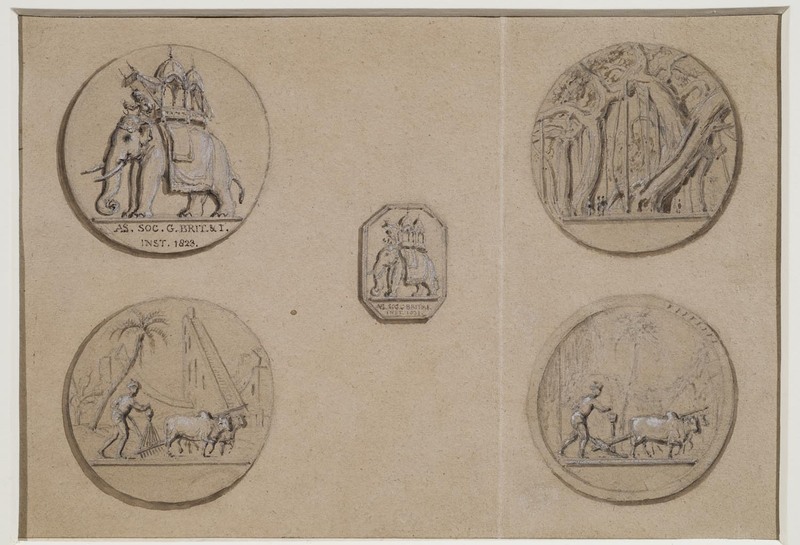 Four designs for a seal and one for a signet, Thomas and William Daniell. These were commissioned in 1823, soon after the establishment of the Society. The elephant continues to feature on our letterhead to this day. The last display, connected with the Water Writing Workshop in November, was removed from the cabinet before we closed for the Christmas period. I arrived back after the break to an empty cabinet and the Reading Room looking relatively bare. Delving into the Paintings and Drawings Catalogue, I discovered several pictures that featured elephants, three of which were of a suitable size to go on display in the Reading Room. The first example I chose shows the Battle of Haldighati. 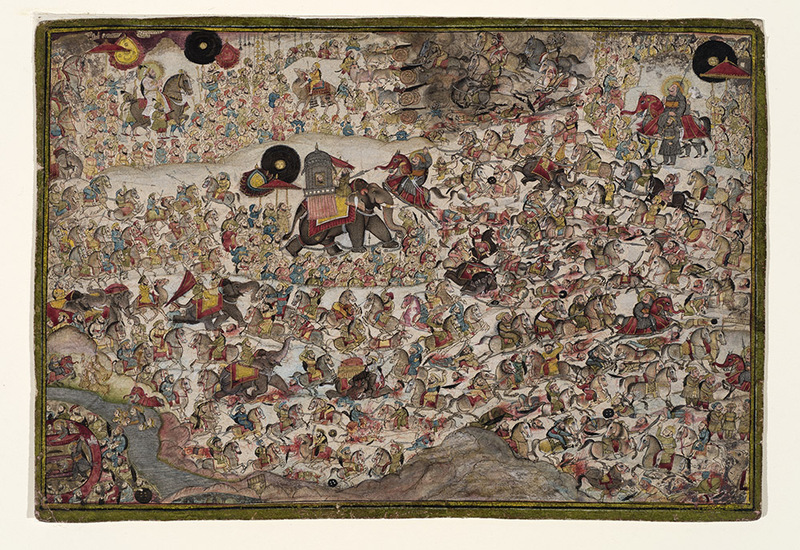 This battle took place between the forces of Rana Pratap Singh of Mewar and an army of the Mughal Emperor Akbar, in which the Rajput warriors were outnumbered and defeated by the Moghul forces. The painting shows a haloed warrior, seen both attacking and retreating, and in the lower left-hand corner he swims a river with the aid of four women, climbs into the Rana’s tented enclosure and kills his opponent with a sword. It was probably painted by Chokha (fl.1799-1824), a renown Rajasthani artist, and dates from the period 1810-1820. 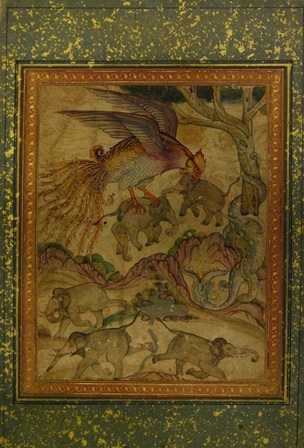 This painting shows the Simurgh or Rokh stealing elephants from their herd while a dragon, coiled about the tree, breathes flames towards the bird. It is inscribed on the reverse in Persian “taswir-I simurgh” and in pencil “ya rokh”. It is also inscribed in English, “The Simurg or Roc of the Arabian Nights”. This watercolour is a late 18th century Mughal miniature painted in the style of mid-17th century originals. It is one of nine that were formerly in the possession of Major-General John Staples Harriott (1780-1839) who fought in the 2nd Maratha War. Harriott was the author of several books and articles. He was also a generous benefactor donating many book, manuscripts and sculptures to the Royal Asiatic Society. 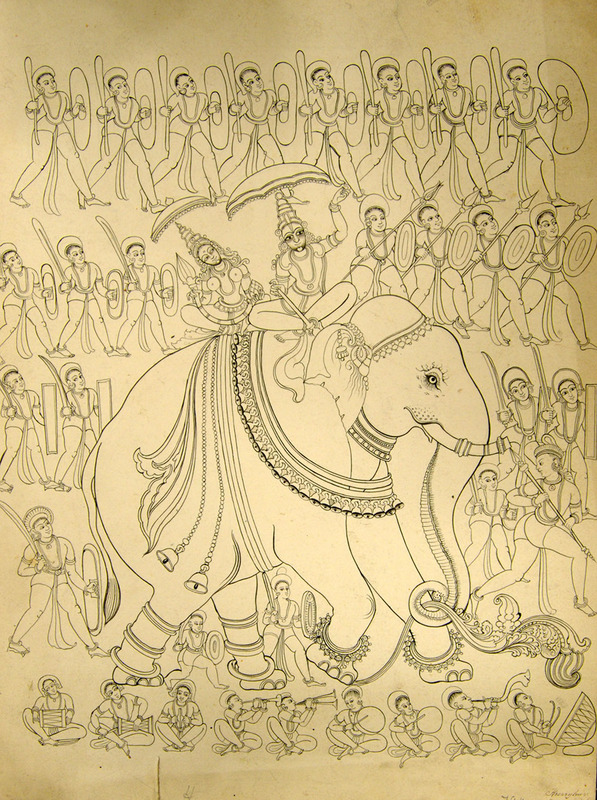 The third picture chosen for the display shows Siva and Vishnu, taking the form of a woman, riding an elephant, accompanied by musicians and warriors. Inscribed on the front is “Hurryhar 30 Novr 46” and on the reverse, “Hurryhar Mysore Temple dedicated to Harihara an idol representing a form of Vishnu & Hara or Siva”. This pen-and-ink drawing is part of a set of six by a Mysore artist c.1846. They depict sculptures and temples of Mysore. I hope that some of you may have a chance to come and see these items whilst they are on display – their photographs fail to show the real details and texture, particularly of the Haldighati and Simurgh paintings. One opportunity to see them would be at our first lecture of 2017. At 6pm on Thursday 12th January, Dr Edward Anderson (Smuts Research Fellow in Commonwealth Studies at the University of Cambridge) will lecture on “Hindu Nationalism Abroad: The Indian Diaspora and Hindutva’s Early Transnational Development (1946-77)”. We hope you will be able to join us for this first lecture of the new year and that you will join us again on Wednesday 18th January, at 6.30pm, when the Hon. James Stourton (Senior Fellow at the Institute of Historical Research, London University) will lecture on “Reflections on Chinese Porcelain Collectors”. All are welcome to both events and also to visit our Reading Room whenever it is open on Tuesdays and Fridays from 10-5 and on Thursdays from 2-5pm.